For my latest historical sewing project, I’ve been working on a yellow linen Regency era vest. Before I debut the final piece (although it’s not a secret, you can see my progress on Instagram! ), I wanted to share some of the inspiration behind my color, silhouette and embellishment choices! Although I’m making my vest from an extant museum piece, I’m not copying it exactly. I’ve used popular color combos of the time (yellow and white), trims (Hussard inspired buttons and placement) and motifs (like the Napoleonic bee embroidered on back!). I’ve also modified the construction, but I’ll go into that when I show you the finished piece! What are you guys sewing/crafting these days? This young man was also at JAF and does wonderful military interpretations. An example of what the market fair booths look like. Ever wonder what it’s like to go to an 18th century market? 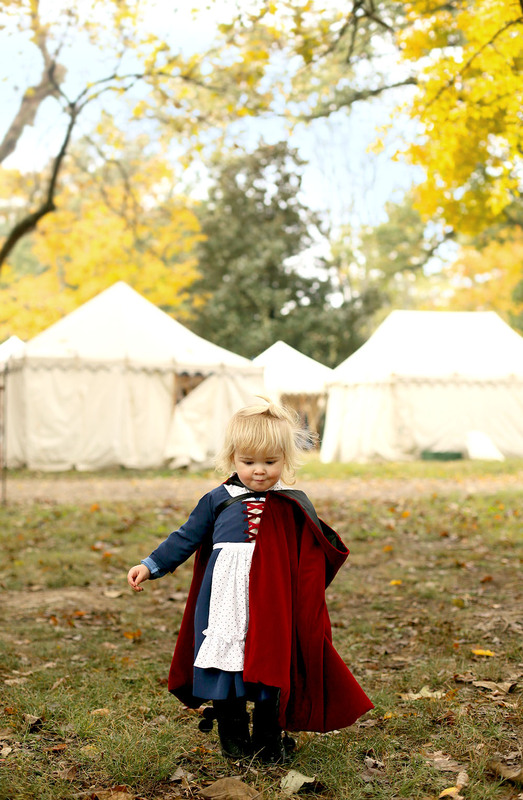 What early Americans would wear, eat and buy? We got the chance to take it all in last weekend when we time traveled to 1778 just outside of Louisville, KY at historic Locust Grove! 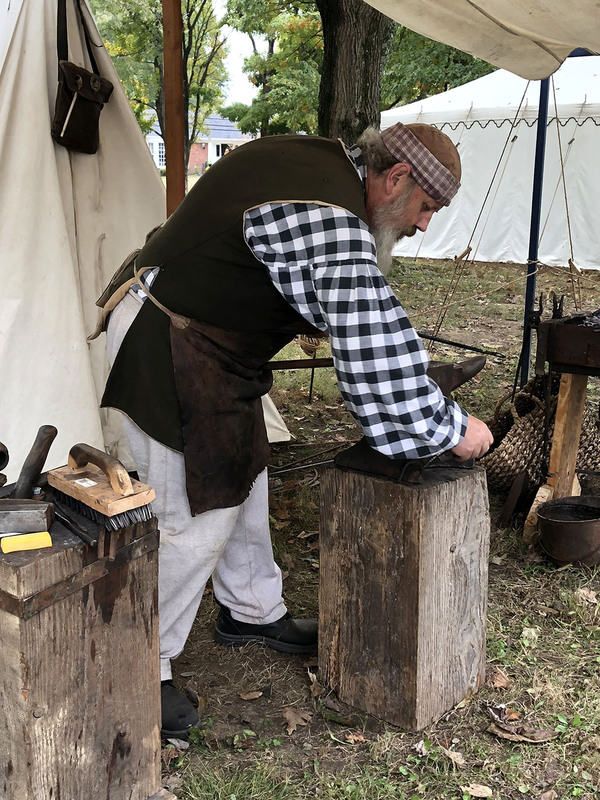 For just one weekend, historical interpreters set up camp in canvas tents. There are market sellers, tradesmen and women, entertainers and both the Continental and British forces, plus their camp followers. A lot of the vendors also set up their personal camp within their larger booth tent, and we’re not just talking cots! One woman let me peek into her bedroom which was a full wooden queen bed, along with a dresser and some chairs! Another family moved into one of the historic cabins and it looked so authentic! Maybe one day when the kids are older we’ll get the chance to do the same! I wish I had more photos, but much of our time was spent chasing the kids around! They got a lot of compliments on their little costumes and I sure was a proud mama! Pretending to play a colonial game of Fox and Goose. These are Hessian Mercenaries who fought with the British. I LOVE THEIR PANTS. Just like his country, my little Alexander Hamilton is young, scrappy and hungry. Now that it’s complete, I’m so excited to share Felix’s 18th Century Market Fair and Halloween costume! I’d love to tell you more about how it came together! To create this costume, I ordered a 1970s bicentennial pattern off of etsy in the smallest size I could find. It was nearly complete - just missing the shirt sleeve - which was easy to measure and draft on my own. I’d say I did a pretty decent job with visual accuracy but because this is a kids costume, I did take some modern shortcuts, which I’ll explain below. Felix’s ruffle shirt is a basic white cotton. The waistcoat and breeches are a natural undyed 100% cotton denim. His jacket is cotton flannel and faced with left over denim from another project - it was a little too limp on it’s own and again, because it’s just for playtime, I didn’t want to make it out of an HA wool. It has a simple contrast natural muslin lining. I did kind of go all out on the real metal buttons, but I ordered them from China on eBay, so it wasn’t a fortune. I think they’re actually the glue that brings the whole costume together and I’m so glad I went for it. I can also remove these and put them on future versions of this costumes (should that be requested) so I know they won’t go to waste. I’m hesitant to point out the mistakes, but if you see it, I see it too. There’s one kid of major mess up, but it doesn’t take away from my happiness with the end result! And I’ll just leave it at that! Lastly, how about that tricorn!? I used one of my old fedora floppy brimmed hats and reblocked it into a round crown with the brim steamed up into three points. I trimmed the brim with petersham ribbon and used an awl to poke a series of holes to lace leather cording through to keep it from flopping around. At Market Fair one vendor gave him a play pipe to tuck up there and he decided to put his newly purchased whistle on the other side. I bought him sweater leggings for the girls section to go underneath but told him they’re just long underwear. On his feet are his everyday black rainboots, a strategic purchase from earlier this fall. So that’s Felix as Alexander Hamilton! I love the way my little dude rocks this look and I’m so happy to see him jump, roll around and play in it! It’s already been through the wash once and stood up nicely to laundering. If I’m lucky, he’ll ask to wear it everyday. 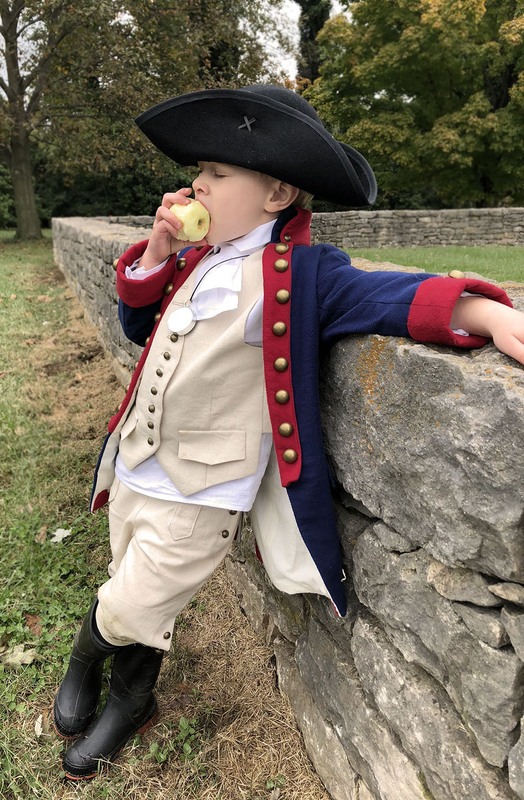 In preparation for Market Fair next weekend, I wanted to have 18th century outfits for my kids AND have them pull double duty as Halloween costumes! (You can see mine here!) 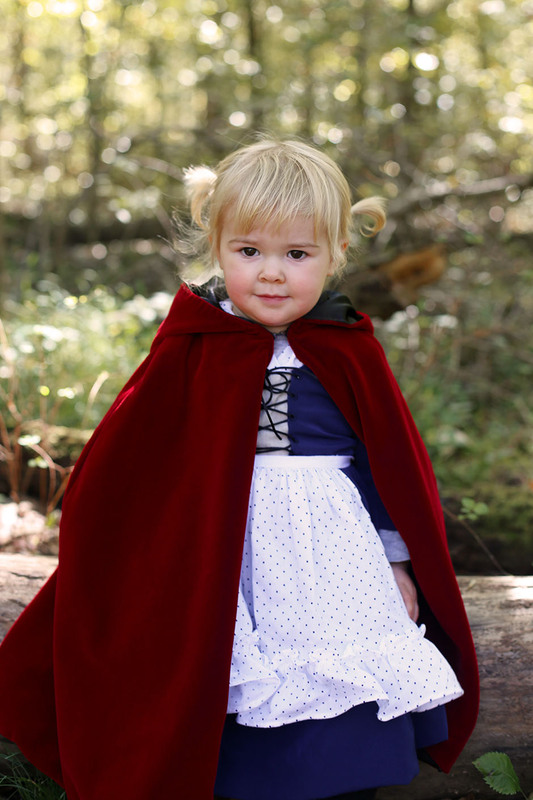 My mom graciously volunteered to make a red velvet cape for Bea to wear over her dress, so voila! 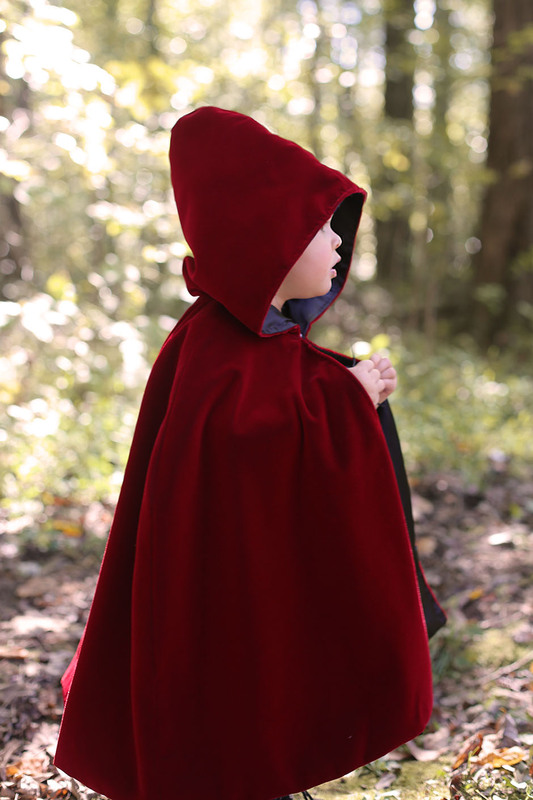 Little Red Riding Hood! There’s something so gorgeous about the way the red velvet looks in the sunlight! It’s made from a store bought modern pattern (I don’t have the number… I’ll look!) and slightly altered to fit Bea’s height and shoulders. It’s a smidge big, but that’s how play clothes should be. And no, I’m not worried about whether or not she’ll get it dirty. She’s a little girl and it’s a costume! The dress underneath is my attempt at making an 18th century dress modifying what I could find. The base fabric is a faux silk (read: poly) matte satin that I paired next to left over linen for the center panel. I did do handworked buttons on either side because I like the look of them and sewing them is fun! It’s laced up using some black cording (in some photos, I had it tied at the top and Bea pulled it out - I’ll re-lace it the other way next time!). The skirt is pleated for fullness, but covered by her polka dot apron. I let her pick that fabric (as in, I held up two choices and asked which one she liked better!) and this was her selection! The apron was made in the same was as my full sized version but done by machine. Her fichu is just a square folded on the diagonal that I safety pinned to her long sleeve tee she wore underneath (she wore regular leggings under as well). That’s just about it! The dress zips up the back which I kinda of regret because it looks so not 18th century, but it’s not visible when she’s wearing her cape. I could also pin her fichu over her dress instead of under and that would solve the problem. If I have time, I’ll make a little white cotton cap for her to wear at market fair, but those pig tails sure are cute! Time to time travel, baby! I love hats! Especially the fancy, floral, floofy numbers from bygone ears. For a large part of history, women wouldn’t leave the house without a chapeau! For my 1780s look, I decided to work with a straw hat I had in my stash. Once upon a time I thought I might have a go as a milliner and thus collected a lot of straw hat bodies and blocks to make new hats of my own. This base was actually a modern hat, but the size was perfect for this project. Here’s what it looked like when I started. After removing the inter and exterior bands I started steaming the hat out. 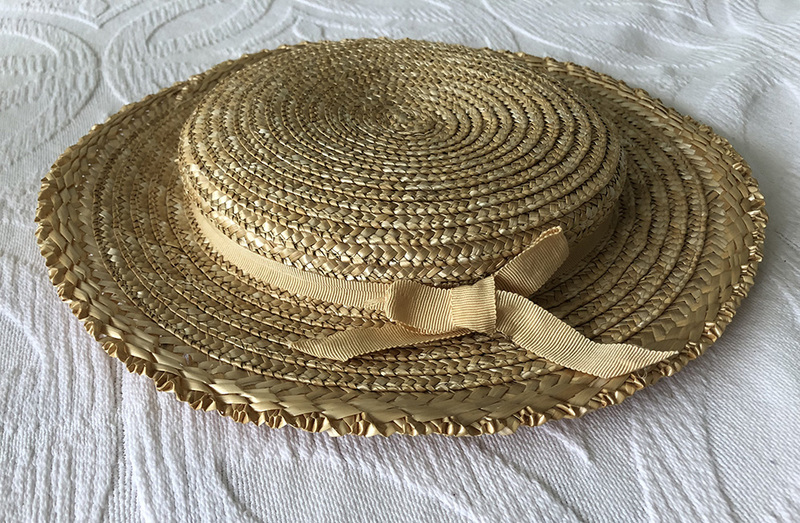 Moisture allows the straw to relax and take a new shape (which is why you may have noticed if you get a straw hat wet at the beach, it will lack the definition it had when you bought it). I wanted it to have a very shallow crown, like a bergère hat that was popular in the 18th century. I knew I’d be covering the hat with fabric, so an identical shape wasn’t necessary - just the rough form. I also found that I could flip the back brim up and it would hold nicely, which I knew would be a good place to slip in some decorations. I gave the whole thing a good steam and let it dry. Next I started on my fabric covering. Around the brim I created half inch pleats using a cotton sateen, a bajillion pins and a ton of patience. I first pinned the pleats to the edge of the interior brim, as you can see at the right. As I brought them to the edge of the brim, I let them spread just a bit and then brought them back in on top where the brim meets the crown. This was an easy place to become too perfectionist and fiddle! One thing I like to remind myself about historical sewing is that imperfection is historically accurate. We’ve become so accustomed to huge racks and full size runs of identical garments it’s no wonder something handmade feels a bit foreign to the eye with a little jumping stitch here or a slightly bigger pleat there. I’ve started to really love what a handmade piece looks like - one of a kind! So anyway, when I got the brim pleats to a place I liked with pins, I hand sewed it down to the straw. With the whole brim complete, I moved onto the brainy bit at the top. I used the same fabric but in a darker shade of blue and I love the combination of the two. For this part I turned to The American Duchess Guide to 18th Dressmaking (which I highly recommend!) and used their tutorial in the 1780s section to create the texture. Once it was all pinned in place, it also got tacked down with heavier buttonhole thread. Now that the top of my little hat looked perfect, I set out to make the inside of the crown just as lovely. I made a very large and shallow tube (only a few inches deep) which I gathered at one side and created a drawstring channel at the other. The gathers were drawn in to match the circumference of the crown and sewn down. The drawstring channel was also draw up using a piece of string, tied, trimmed and tucked into the new crown covering. I also made two ties that were tacked down before the gathered interior crown bit went on. These let me to pull the hat down tightly and further emphasize the flipped up back! Lastly was the question of feathers - how many and in what placement. After trying a bunch of different combinations, I settled on just one white feature layed horizontally in the back and tacked down. In all I used 1 yard of light blue fabric and just a half yard of the darker blue. I had enough leftover to make a matching waist sash/belt to coordinate everything together. Because there are so many pieces to an 18th century kit (shift, stays, petticoats, bum rolls, socks, shoes, buckles, gown, fichu, apron and hat to name a few) I think I’ll keep my costumes from this era in the same general color story with this pretty blue as the common link. I can’t decide if I should make one more gown (I do have the fabric on hand) as a birthday present to myself (it would photograph so beautifully in the snow! ), do some modern sewing or start planning for the next era. I realized when I was sick for a day earlier this week that I cannot not have a project sitting around to pick up and play with. And as all of our outdoor chores are coming to an end for the season and it’s time to sit by the fire for the next few months, I do think another lap project is in order. Are you interested in progress shots or is a big reveal more fun? I’m not sure which way to take this one on. Let me know what you think!